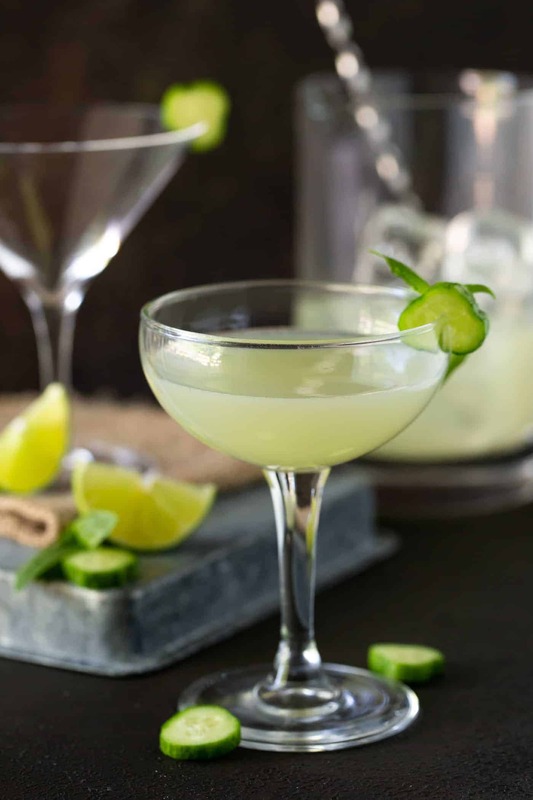 Keep cool this summer with this refreshing Cucumber Vodka Gimlet recipe! A vodka gimlet was my dad’s favorite cocktail. Truth be told, he was definitely more of a beer guy, but when he did have a cocktail, I remember him ordering a vodka gimlet. Think of a gimlet as a martini’s sweeter cousin. This Cucumber Vodka Gimlet recipe is my version of dad’s favorite cocktail updated with the flavors of fresh cucumber and basil. What is a gimlet cocktail? Not to be confused with a similar sounding word (giblet – think turkey and Thanksgiving…definitely not the direction we’re going today), a gimlet is a cocktail usually made with either gin or vodka and Rose’s Lime Cordial (the electric green bottle next to the grenadine). History mentions that gimlet cocktails originated with British sailors in the 19th century as citrus juice was thought to prevent scurvy. This “medicine” became more socially popular in the 1950’s after a fiction author named Raymond Chandler made it the drink of choice for the detective in his novels. That must have been where my dad picked it up. Raymond Chandler did for gimlets what James Bond did for martinis. ? I knew I wanted to deviate from the traditional gimlet recipe made with lime cordial because I crave fresher flavors (and non-electric green colors), so I added cucumber and basil to my recipe. The process for making this Cucumber Vodka Gimlet is similar to making a mojito because you muddle the chopped cucumber and basil leaves together with sugar and lime juice. I prefer to drink my gimlet straight up in the more traditional fashion, so I shake and strain the drink, but you can definitely serve it over ice if you prefer. Also feel free to swap in gin for vodka if you’re more of a gin fan. A muddler with a long handle is perfect for making this cocktail or other cocktails like mojitos that require you to muddle the ingredients in a tall glass. Bonus points for this set as it also includes a cocktail spoon for stirring! I have about 3 or 4 sizes of fine mesh sieves in my kitchen, and the small one in this set is perfect for straining drinks. 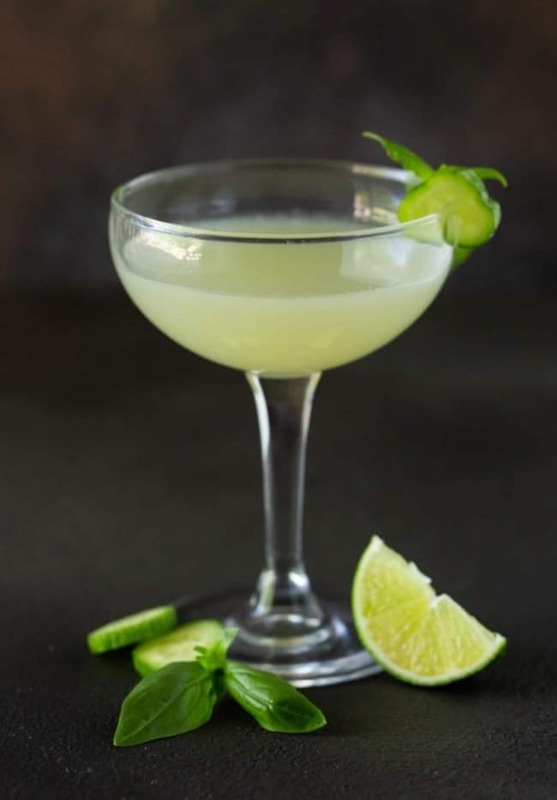 Cool as a cucumber is definitely a fitting description for this Cucumber Vodka Gimlet recipe. It’s one I’ll be making on repeat to beat the heat all summer long. Thanks for the inspiration, Dad. Tip: The recipe can easily be doubled or tripled to make enough for a crowd and keeps well in the fridge if made in advance – a bonus when entertaining. Follow us on Pinterest for even more tasty cocktail recipes! Follow Garnish with Lemon’s board Cocktail and Drink Recipes on Pinterest. 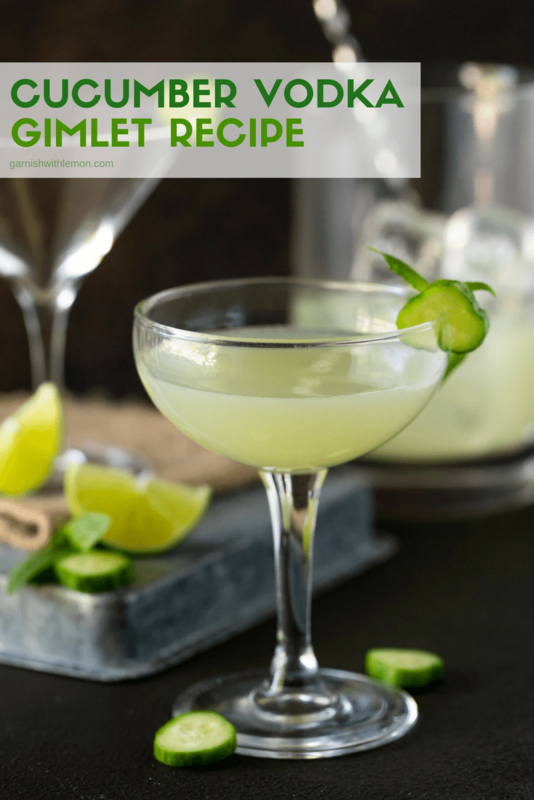 Are you now a gimlet fan? Check out some of these other delicious gimlet cocktail recipes! Place sugar and 1/2 of the cucumber pieces in a large, wide-mouthed glass or 2-cup measuring cup. Muddle lightly. Add lime juice and stir until sugar is dissolved. Pour lime juice mixture through a fine mesh sieve into another 2-cup measuring cup. Stir in vodka and water. Fill two lowball glasses with ice. Divide cocktail and remaining cucumber pieces between two glasses. Garnish with basil. I would like this recipe for mixing in a large gallon container. Hi Kim, you can easily multiply the recipe to get whatever number of servings you need. I hope your guests love it!